Budapest Airport is piloting an intelligent video-based solution to manage queues at security checkpoints. To make this possible, five new Bosch cameras were integrated into the existing network. Waiting times at airport security checkpoints are often unpredictable, making them a headache for travellers and Security Managers. 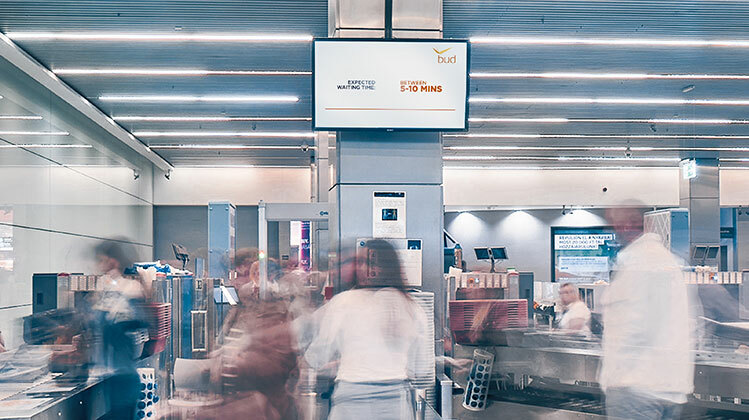 The right technology can help – such as an intelligent solution that keeps lines from getting too long at Budapest Airport. As part of a pilot project, the estimated waiting time is displayed on a screen at Terminal 2A. There are two checkpoints, one for each terminal, and travellers can choose where to get in line based on the current waiting time for each. For instance, if one of the checkpoints is very crowded, but there is hardly anyone at the other, travellers can go to the latter to save time. “The challenge lay in distributing travellers evenly between the two checkpoints for the respective terminals,” says István Szabo, Security Director, Budapest Airport. It wasn’t necessary to invest in a wholly new camera infrastructure to make this possible – instead, five new Bosch cameras were integrated into the existing network. The video cameras deliver excellent image quality, providing the right material for further data processing using an algorithm. This allows the solution to recognise how many people are waiting at each checkpoint entrance and when they pass through the exits. In turn, the solution can calculate an average waiting time and display this to travellers who haven’t passed through security yet.